Over the years, we have created different versions of the Father's Love Letter video using the same audio narration but with different visuals. These videos have been watched by millions of people around the world and touched a countless number of hearts. We've also created a new video version for 2017 that minimizes the music & visuals so that the narration really stands out. You can watch or download all 5 of these videos below. Click here to watch or download an extended 17 minute soaking version of this same video on Vimeo. 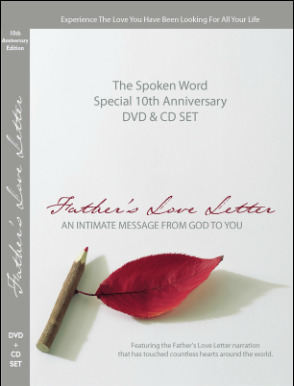 as part of our 10th Anniversary Father's Love Letter CD/DVD set. Father's Love Letter HD videos. For more information, go to our ​online stores link below.